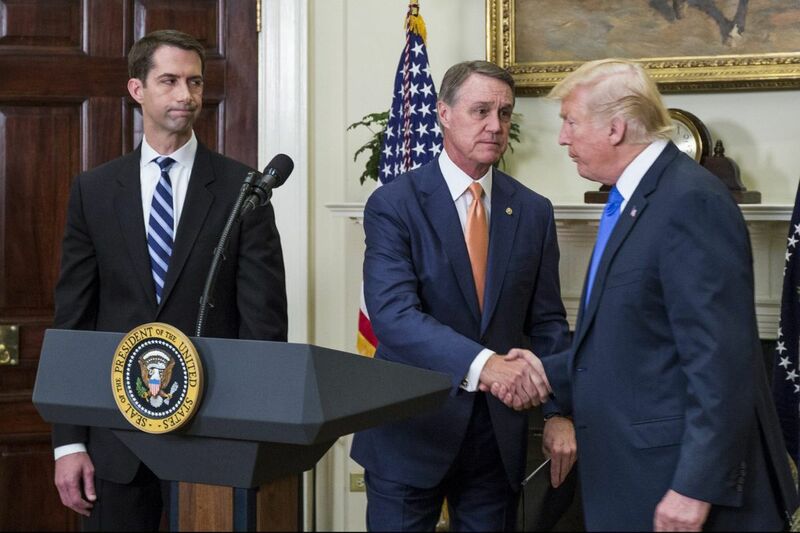 President Trump shakes hands with Sen. David Perdue (R., Ga.) during introduction of the RAISE Act last week as Sen. Tom Cotton (R., Ark.) watches. If the bill, which would reduce overall immigration while boosting the number of educated immigrants, were to become law, the United States in 2040 would have 4.6 million, or 2.1 percent, fewer people employed. If immigration were cut in half, the size of the U.S. economy would be 2 percent smaller in 2040, the research group said. "If you were just to increase the skill mix of new immigrants to be 75 percent with a college degree or more then in the long run that would increase GDP by 0.37 percent," said Kimberly Burham, managing director of legislation and special projects. "Where this bill is taking the hit as far as future economic growth and job growth is concerned is by reducing the total number of immigrants coming in every year," Burham said. "In the long run, if those immigrants had those jobs, then they would have contributed by working and by saving and there would have been more for everybody." The Penn Wharton Budget Model, led by Kent Smetters, a professor in the department of business economics and public policy at the Wharton School of the University of Pennsylvania, was launched last year with the goal of using "advanced economic modeling, big data science, cloud computing, and visualization tools to provide a 'sandbox' in which different policy ideas can be tested before legislation is drafted," the group said in a May news release announcing a $6.6 million grant from the Laura and John Arnold Foundation. Funders listed on the group's website also include Steve Ballmer, longtime chief executive of Microsoft Corp.; S.A. Ibrahim, former CEO of Radian Group Inc., a Philadelphia mortgage insurer; Marc Rowan, a cofounder and senior managing director of Apollo Global Management L.L.C. ; Marc Spilker, founding member of GPS Investment Partners L.L.C. and chairman of Chiron Investment Management L.L.C. ; Leonard M. Tannenbaum, chairman and CEO of Fifth Street Asset Management Inc.; and David Trone, founder and president of Total Wine & More, described as the largest privately owned alcoholic beverage chain in the U.S.
All except Ballmer have degrees from Wharton. A key difference between the Penn Wharton Budget Model and the Congressional Budget Office, which has not analyzed the RAISE Act, is that the Wharton group projects the impact of proposed policies beyond the typical 10-year time frame of the CBO. While it did not happen with the immigration study, "we're trying to make policy options available before bills are being proposed, so that policymakers can see the impact before they have set their stakes in the ground and made public statements," Burham said.